Well, have we got a lot to tell you about this month as we have not stopped still long enough to draw breath! 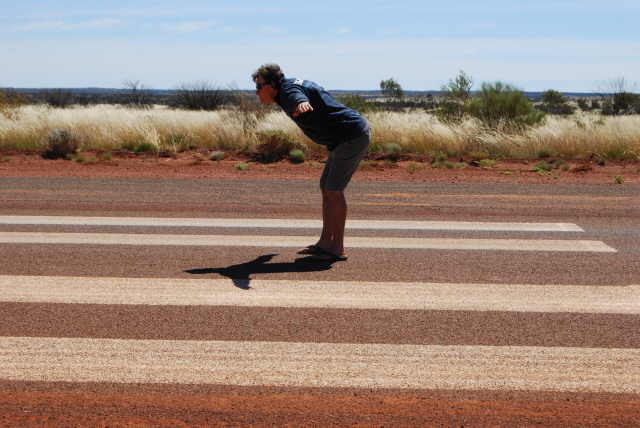 As I said last month, the beginning of April saw us head in the wrong direction, back to Kings Canyon from Yulara (Ayers Rock) to spend a few days with some good friends that we made while living in Yulara, the Murphy's. We had a great time with them and are currently trying to talk them into coming to Vietnam early next year with us. We did the rim walk again (my 5th time and Chris and the boys 4th time) and continue to be amazed at how beautiful the area is. This really is a must see when out this way. 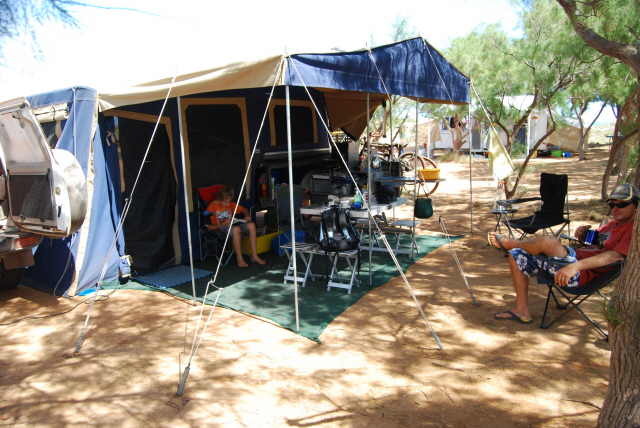 We ended up having three nights there and then headed back to Yulara for one more night at the Fire Station with the Murphy's before heading off across the Great Central Road. Our last night was not as relaxed as I had hoped. We had new gas struts posted to us in Yulara as the new solar panel rack had made the base of the camper too heavy to lift each time we stop, when we need to unload our boxes. I replaced the main struts easily, but then decided to use the ones I had just removed to replace the slightly smaller ones on the solar panel frame. I removed the old ones from the solar panel frame only to discover that the mounting brackets had been put in the wrong place. We were now unable to put the new struts back on. Without them we are unable to set up the camper. Great! We had to work out a way to compress the struts about 50mm to get them on. Impossible, as at 900 newtons each they are just too strong. We even had the Fire and Rescue truck out using the jaws of life but they would not open enough to get the strut in its jaw. Only option was to weld on new brackets. Luckily the Fire Station has a welder, so Murph and myself are out in the dark cutting and welding on new breackets. Not my idea of a relaxed last night but better to discover it there than down the road somewhere in the middle of nowhere, when I decided to change the struts over. And by the way, the new1400 Newton struts are perfect. The base goes up much easier and now stays up. All's well that ends well. Thanks Murph. You got us out of a real pickle, or did you just want to get rid of us from your yard?? The Great Central is one of only three major routes across to the West (that go directly East - West). It is the only one that is dirt, 1250 kms of dirt in fact. We had a reasonable getaway being on the road after all the goodbyes by about 0900. 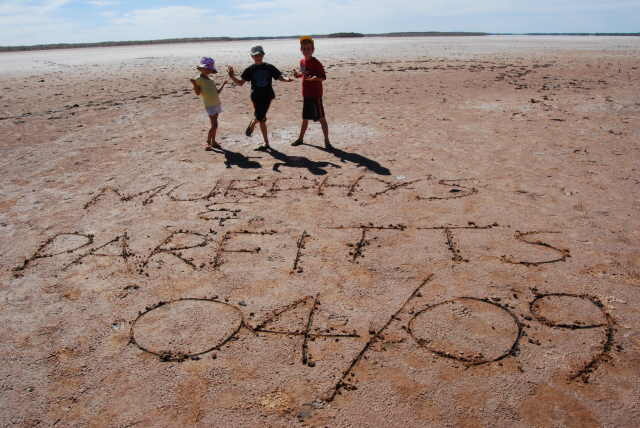 We said goodbye to the Rock, at least for a while and headed out past the Olgas to the beginning of the dirt. We passed through Docker River (we were going to work there at one stage) and visited Lasseter's Cave. Our first night was at Warburton (an aboriginal community with a roadhouse attached), about 500kms from Yulara. While we expected to be staying somewhere pretty horrible, it actually turned out rather nice. Green grass, I kid you not, and hot showers was more than we expected. There were about 5 others staying there that night which was nice. We did have a little bit of action. When I woke in the morning and looked out the window I noticed that Harry's brand new bike had been flogged from the front of the camper. It travels by lying down on the front of the trailer strapped down with webbing straps. Our heads when in bed are literally inches from the bike and sometime during the night a local came in, unstrapped the bike and lifted it off while we snoozed on throught the entire event. They then climbed on the roof of the car and took the lids off all the jerry cans looking for a bit of unleaded fuel to sniff. Unfortunately for them we only had water, so they were left untouched. Chris suggested that I have a walk around to look for it, and bugger me, there it was at the gate, leaning up against the fence. Luckily for us I had taken one of the peddles off, so it would travel better. They obviously had trouble using it as a getaway vehicle, so abandoned it and took off on foot. How lucky was that? Now back to the road. The NT side of the Great Central was pretty ordinary but once we hit the WA border the road improved immensely, with us averaging 80 -90 kms/ hr, but at times down to 60km/hr. There are some great roadhouses scattered along the route all offering obviously fuel, but also food, groceries and very good accommodation. We were very surprised at how well appointed these very remote roadhouses are. The fuel was not as expensive as we had expected with it being $2-00 / litre for diesel. When you consider we are paying up to $1-60 / litre on the west coast that probably makes the fuel on the Great Central reasonably well priced. 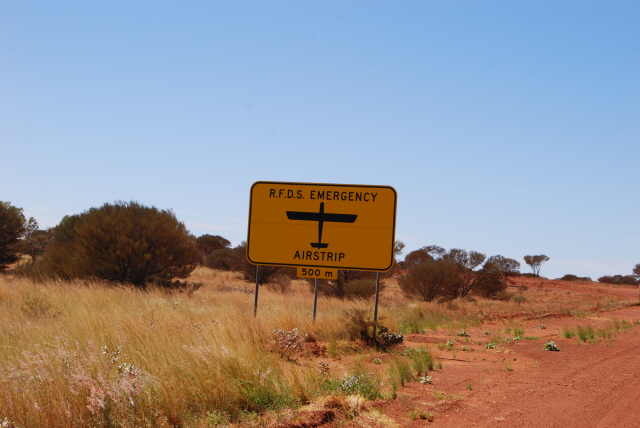 In 3 or 4 places across the Great Central you get a 30 second reprive from the dirt when you come across the RFDS Emergency airstrips. Bitumen at last! Oh, gone again. Wouldn't you get a shock, minding your own business, cruising along when a plane flies overhead and lands in front of you. It would be like something out of a James Bond movie. The road is long with some soft sandy sections, but generally in good condition. You certainly could take a normal car across, but it would cop a bit of a shaking. Our next stop after a 700km day was the vibrant little mining town of Leonora. The dirt had ended about 100 kms earlier at Laverton, and while we were glad to be off it, we did in some funny way miss it and its constant shaking. Travelling that distance in some of the country's most remote areas does add a sense of adventure. It is extremely unforgiving and we only passed a few cars a day. The scenery is at times interesting with mountain ranges adding a new dimension to the otherwise flat canvas. I was glad we had spent the money on the new HF radio earlier this year as it was great for that 'peace of mind'. To test it was working as well as I had hoped, I made a couple of phone calls from the middle of Australia, and very much in the middle of nowhere. The reception was amazing, being as clear as any other phone call. Mum thought it was amazing that we could ring from such a remote location. If something went wrong, it is nice to know you have that ability to call for assistance. The car and the trailer took it all in their stride, with not as much as a flat tyre. It was comfortable and effortless. Anyway, back to Leonora. We booked into the extremely nice local caravan park for the princely sum of $15-00 a night. Plenty of green grass and a clean modern toilet block made this a great find. There is a lot to see and do in this 'central' area and it was a shame we did not have the time to spend a bit more time exploring. Sandstone in particular is one of the quaintest little towns we have encountered yet. The old sandstone buildings (I guess hence it's name) have been beautifully restored, with well maintained parks scattered around. This really is a proud country town. If you are planning to travel this way, allow yourself a week to have a good look around and to soak up the great country hospitality. The next day was a monster ( must have been around 950 kms) with us heading north to Leinster and then heading west across to Sandstone, Mt Magnet and then across to Geraldton. It was far too much for one day but with Chris doing half the driving it didn't seem too bad. We arrived in Geraldton just on dark and did our first "in the dark setup", which actually went rather well. 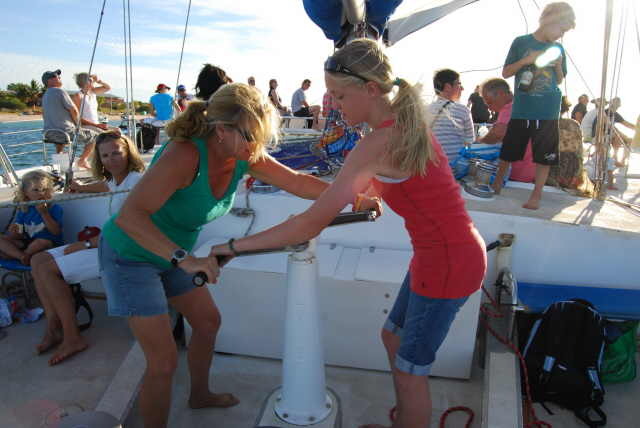 We spent 2 nights in Geraldton with most of this time spent washing and shopping. Chris finally got to buy a polarizing filter for her camera which she had been hanging out to get, ready for all those water shots now that we had made it to the coast. As those regular readers are aware we covered most of this area in May/ June 2006. This trip we do plan to revisit a few favourites and to see a few places we did not get to last trip. 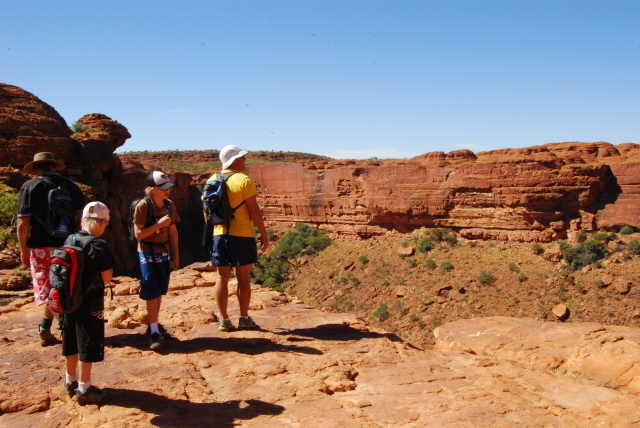 Western Australia has just so much to offer and so much to see that you could easily spend years exploring it alone. What we did discover on our arrival to Geraldton did not make us very happy at all. While we realised we were hitting the coast at Easter we did not realise that WA has two weeks Easter school holidays and that this coastal stretch is "Perth's Playground". We actually had to book places ahead and we were extremely lucky to get into any at all. To say the least our timing was crap, but that's life. The up-side was that there were plenty of families and kids around. We met up with two families that we travelled with on and off over the next 3 weeks which was fun. 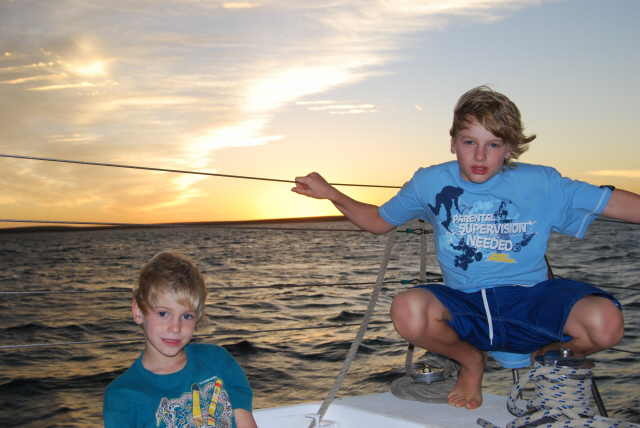 Next we headed to one of our favourites, Denham and Monkey Mia. 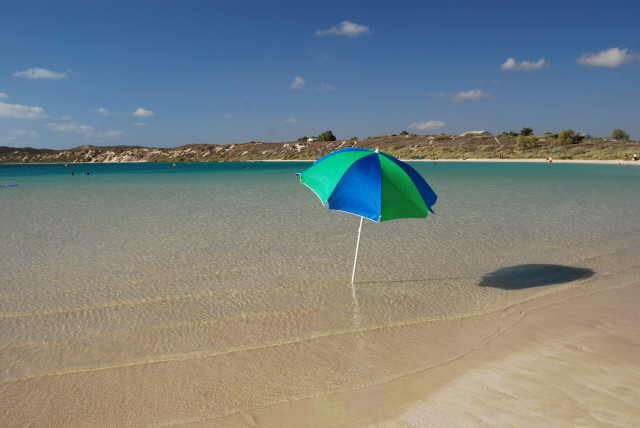 We scored 3 nights in Denham but were unable to get anything at Monkey Mia, which has been booked out since last year. Good Friday we did an 'all day' trip down to Monkey Mia, arriving at 0700 and leaving at 1900 that evening. What a day we had. 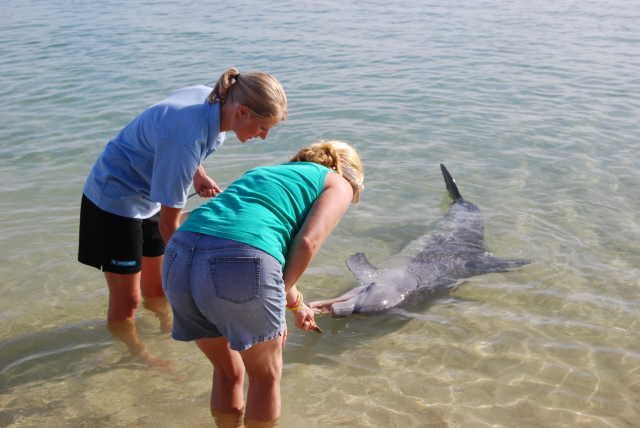 We did the dolphin feeding in the morning with both the boys and Chris being picked to feed them. They have been picked every time we have been (a total of 5 feedings now), with my hit rate currently a big fat zero. It would seem the girly/ kiddy factor is alive and well here. We then swam and sat around the cafe watching the world go by. This place is extremely well appointed, well maintained and an absolute 'must not miss', despite the negative comments so many make about it. We then boarded the 60 ft racing Cat, the 'Shotover'. We had a 3 hour sail in search of Dugong, dolphins and turtles, locating many of each, as well as a 12 ft tiger shark about 100 metres out from the swimming beach. Well, it is called 'Shark Bay'. It was a picture perfect day and heaps of fun. For some reason it was not crowded with only about 20-25 others on the boat. Back to the shore for an hour, a cappuccino, then back on board for a sunset cruise. By then the afternoon wind had really picked up and we had an action packed high speed sailing experience, while having a few drinks. Now that is civilised. 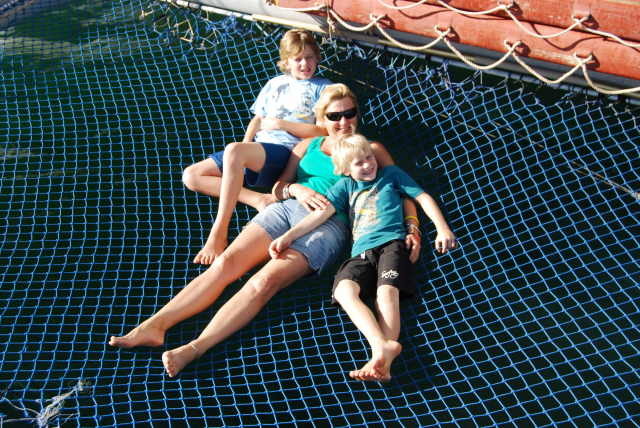 Laying back on the boom nets with the water racing by beneath us was fun. Next day had us out of bed again early and off to Francois Peron National Park. Once again we had seen this in 2006 with our travelling mates, Wayne,Tracey and Bailey, but this area is a 'must see again'. We had a heap of fun, got bogged a few times but managed to get out without needing the MaxTraxs that we bought at Christmas. 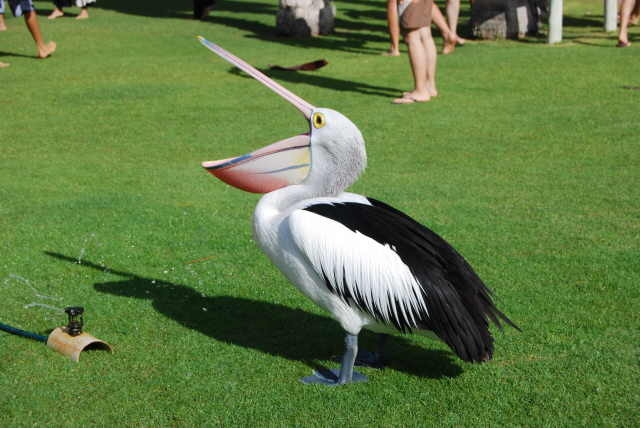 We visited a few places we did not get to see last time and our favourite, Cape Peron again. 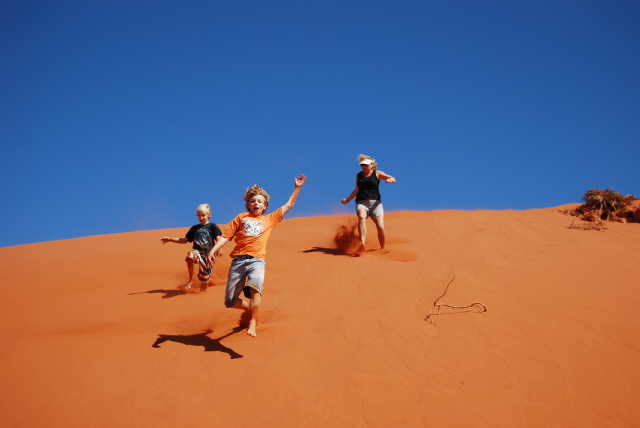 Those vivid red dunes meeting the pure white sand with the bluest of blue skies as a backdrop is a little surreal. We actually got back to the camper before dark and managed a walk along the beautiful foreshore of Denham. We are going to look at the prospect of work around this area, maybe for next year. We then relocated about 50 kms down the road to Hamlin Pool, after dropping into the beautiful and very different Shell Beach. 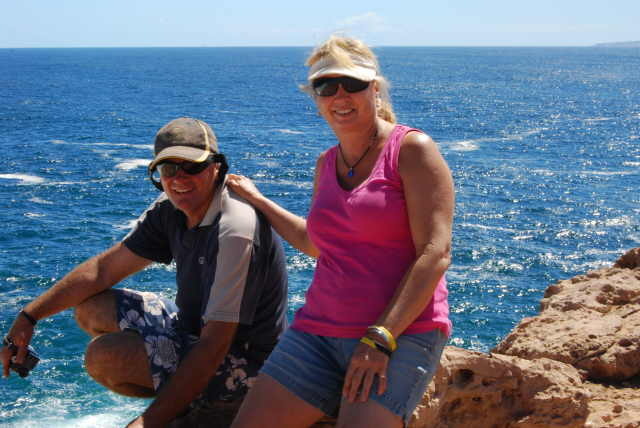 The reason for going to Hamlin, was firstly because we could not get any more nights at Denham, but mainly because we wanted to visit the most westerly point of Australia, Steep Point. Now normally we would have taken the tent to Steep Point and done an overnighter, but due to the holidays it was to capacity and we could only do a day trip. It was a long drive and luckily we got away early as we arrived back after 1900 that night. This trip is not for the faint hearted and is only for high clearance real 4x4 with low ratio boxes, not the new lower clearance all wheel drives. In places it was hard going and even with the tyres down to 20psi we did get bogged numerous times. I can clearly see why very few Australians have visited the most westerly point. 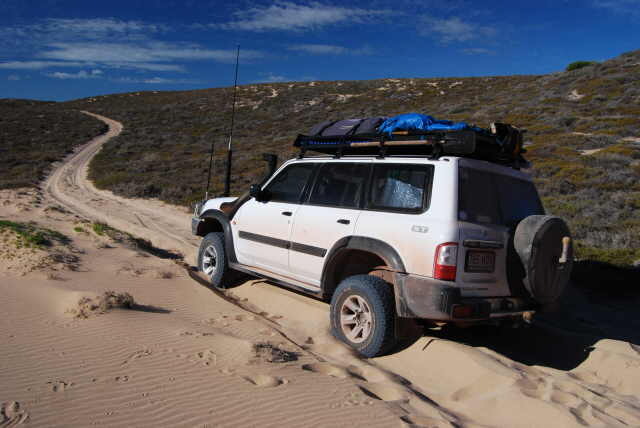 We drove up the much talked about 'Useless Loop Road' to some stunning white sand beaches overlooking Dirk Hartog Island. This really is 'God's Country', spectacular and once again remote. The car worked really hard but did us proud. At times we were bouncing so hard that we banged our heads on the roof. Next time we will be camping out there, and for quite a few days. On our way out, at about 1630 and still with a few hours driving ahead of us, Chris states she wants to see the blowholes at False Entrance. Another 30 minutes of bouncy sand tracks and we arrive at this huge barren area. I get out of the car and firstly notice how wet the area is where we have parked. I didn't think too much of it and I go and have a look over the cliff. The ocean is a hundred or more metres below. In the distance I can see a piddling blowhole that wouldn't have the oomph to push a toddler off a potty. Great, wasn't that worth the effort. As we were walking back to the car we nearly died of fright when 5 metres in front of the car we hear a blood curdling groan and then water spraying out from the middle of the car park. 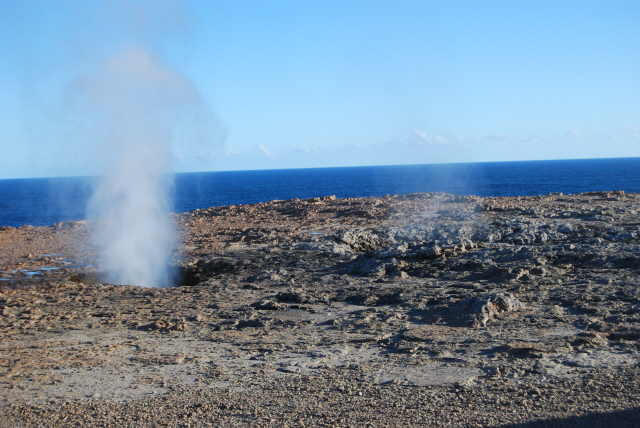 The car was showered with the spray from these unmarked, unfenced and to us, unnoticed two blowholes about 6 ft across. I quickly moved the car and then we stood and waited for the next show. We didn't have to wait long. These really are speccy. What is most amazing, other than the fact that you could drive your car down them (well at least into the top section), without even knowing they were there, is the fact they are so high above the sea level. The force needed to drive the water that high and so far inland (about 10 metres) must be immense. Then 'she who must be obeyed' and tour director wanted to go to Thunder Bay. By now it was 1730 and yes, we still had a few hours drive ahead of us, but always doing as I am told off we went down yet another sandy, boggy track. This time we got to an area that had obviously suffered a lot of erosion. We could see tyre tracks from where some fools before us had gone. Going down didn't look so bad until we turned around and had to try and get back up. Now let's set the scene. Its now nearly 1800 and we recall being told by the Rangers that the track to somewhere is closed due to a lot of erosion and because people have been unable to get back up once in. Oh dear, is this the place she was talking about? Low range, tyres flat as the top of a pool table and plenty of speed. We made it to the top of the first section but then there was a tight left turn. Lack of momentum = lack of traction which = stuck. I backed out and tried the last section again. Still no luck. We just did not have the speed we needed to keep going if we were to go around this corner. Only option, don't go around the corner! That means going straight ahead. There were no tyre tracks going that way, perhaps for a good reason. What lay ahead was a large sand drift that sloped off sharply. The plan was to get up enough speed, get the back of the car to spin around slightly, and for us to start heading up the dune as opposed to rolling over onto our side. So off we went, right foot flat to the floor. While I had the wheel turned in the direction I wanted to go, we continued going straight on an unpleasant angle. Keep going, keep turning that wheel, keep those revs up. Finally we started to turn and then what seemed like forever we were going up the dune, and what's more still moving! We finally made it to the top, what an achievement. I then really wished we had the video going because regardless of the outcome, it would have made great viewing. I did suggest to the white faced one sitting next to me that we do it all again, only this time with the video going. Can you imagine her response? It was a great day out, a great achievement and we now have both the most Westerly and the most Easterly point of Australia crossed off our must visit list. Early next year we will do the most Northerly which will leave us only the most Southerly (Wilsons Promontory- mainland Australia and then Tasmania), to do at some stage. 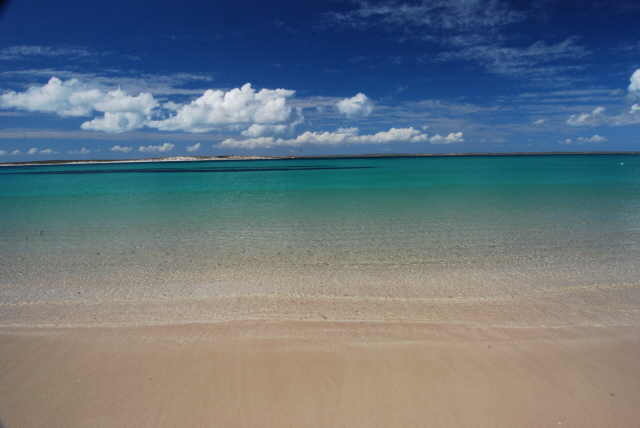 Next day it was off to Quobba via Carnarvon. We did some shopping while in Carnarvon and had the car serviced. Again we arrived at Quobba Station after dark and refined our 'set up in the dark' skills. We had three nights there and spent a little time doing school work and the rest exploring the surrounding area. The coast line here is dramatic and dangerous. High red cliffs, rocks and killer waves. This coastline is unforgiving. No room for mistakes as the number of people who have lost their lives here proves. There is a very nice Council campground at the 'Blowholes' for $5-00 a night. 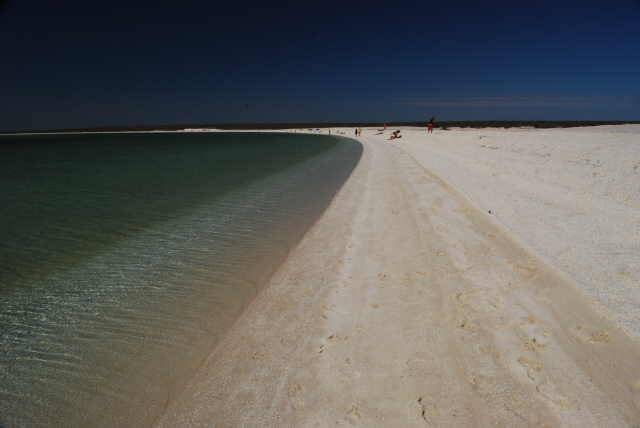 For a few $$ more the campgound at 'Red Bluff' is great with a magnificent swimming beach. 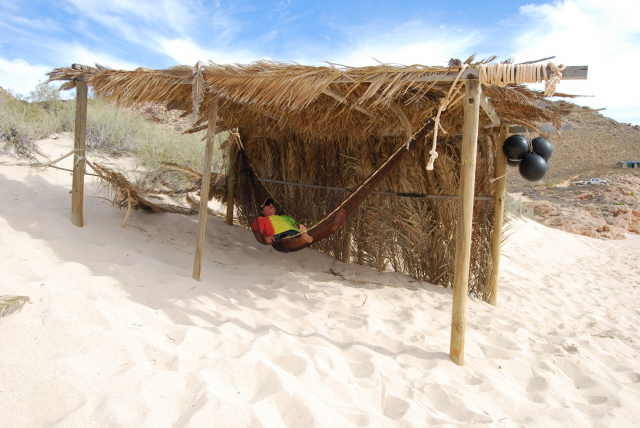 They even have palm leaf covered beach shelters complete with hammock. Now that is luxury. Next stop just a short drive up the road was Coral Bay. How we actually scored 3 nights there is a mystery as we only booked a few days prior to our arrival, and we have spoken to people who tried months ago. We must have just been lucky and got a cancellation. Although as busy as, this place is truly spectacular. It has not changed one single bit in the past 3 years. It was just like we had never left. We had three glorious nights with even better days attached. 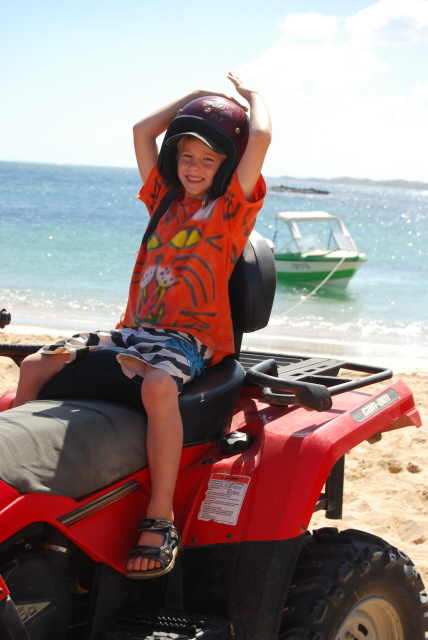 We again did the quad bike tour down to Oyster Bridge and the Lagoon, as requested by the boys. 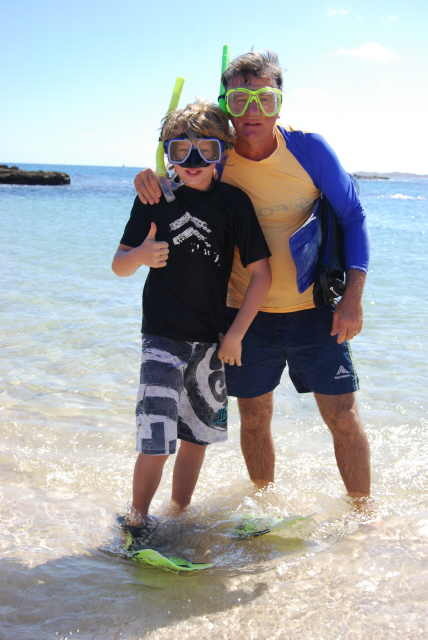 We had a great day, with Harry really enjoying his first coral snorkelling experience. The quality of the coral and the number of fish that you can see here is as good as you will see anywhere on the east coast. 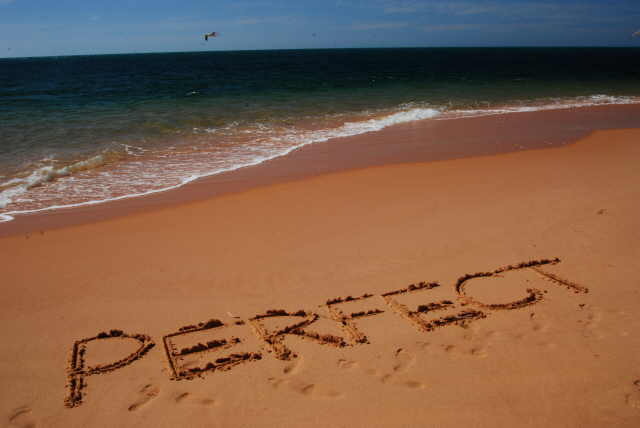 It is very spectacular. That afternoon we discovered an inland 4x4 track and again visited Oyster Bridge for another snorkel. The last time we were here with Wayne and Tracey and the Hammonds we drove along the beach to Oyster Bridge burning up hundreds of litres of diesel between us and nearly got bogged numerous times. This time it was much easier. The rest of our time at Coral Bay was spent at the beach, doing the fish feeding and watching the sunsets with a couple of drinks. We had dinner at the pub with one of the families we had been travelling with. Man alive was there a lot of people there. It was absolutely buzzing. Coral Bay very much reminds me of a much smaller scale of Airlie Beach. You really have to hope that some places never change and stay the same forever. Let's hope the great disease of the 21st Century, progress, leaves this place alone. The boys said that this would be a good place to work and to live for a while. Chris's head was also nodding with great gusto. Just out of interest I popped into the local clinic to see if they are ever looking for short term holiday relief. Expecting this to be a popular spot for staff living in Carnarvon and Exmouth, much to my surprise they are often looking for staff. I was offered a week's work starting the next week and there was also 4 month's work up for grabs. Unfortunately as I have already accepted a contract in the Kimberley's starting in May, a job at Coral Bay will have to wait, until at least after July. Next stop, just 100 kms up the road was Exmouth and Cape Range National Park. 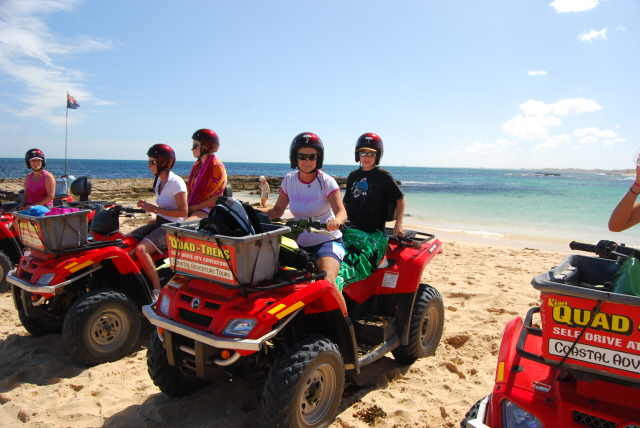 We planned to meet Dean, Jill and Kaitlin in Exmouth. We stayed in the Big 4 caravan park after mortgaging both houses. At $55-00 a night I think this is our most expensive park we have stayed in ever. How they can charge that, and why the idiot travelling public pay it is beyond me. If there is a Top Tourist or an independent in town, always compare the prices, you will be surprised at the difference. Anyway we had a nice night with Dean and Jill and then first up the next morning we headed the 50 kms to Cape Range National Park. Now let me refresh your memory from our last visit here in 2006. We stayed for over a week and it rained every day. The reason that is unusual is that this area has more sunshine days than anywhere else in the world. So as we are driving out again this time, it starts raining. Can you believe it! There were plenty of sites available with us choosing Lakeside this time. It was a lovely campsite, great view, even greater beach and great camp hosts. The weather cleared nicely and the sun again shined. We swam, fished and sat around chatting to the other campers at happy hour. Now for my next little disaster. That night I tried to fix our 12 volt shower (unsuccessfully) and had to open the big box on the front of the camper to get to my tools. This is where we store extra clothes, school work and other important stuff. I then went off to happy hour and left the lid open, then went off to bed. Well that night it bucketed down and as the sun came up I realised I had left it open. Yes, it was wet and so was a lot of the stuff stored in it. No, I was not popular, but we did get it all dried and packed away again. Be assured that will not happen again. Of all nights to leave it open. Murphy's law. We had planned to stay an extra night but then the next morning we were woken very early by horrid winds. We thought we were going to blow away. The forecast was for winds for the rest of the week so in true camping tradition, we packed up and moved on. We will be back, and hopefully it will be third time lucky with the weather. Next stop was Karratha. On our way past we couldn't resist dropping back into Nanutarra Roadhouse. On our way through in 2006 it was the most expensive fuel we encountered around Oz. The price has dropped and is now $1.52 down from $1.86, which now makes it reasonably cheap compared to others. 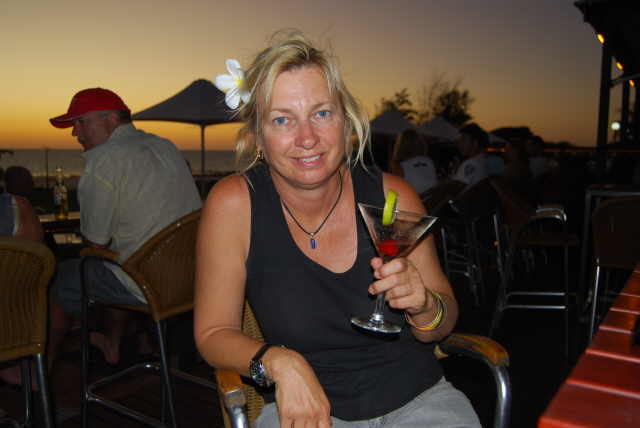 It was getting late as we arrived in Karratha and we had to stop. 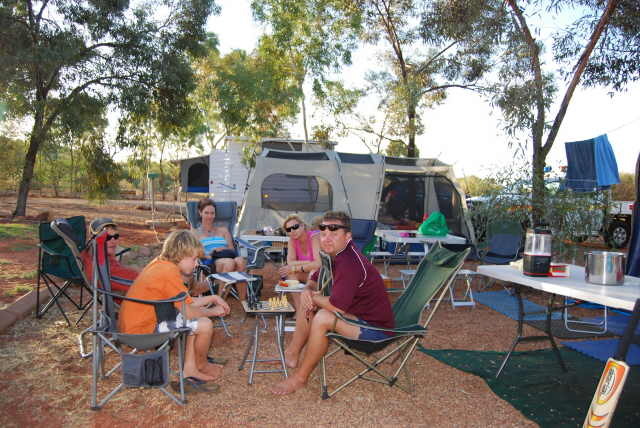 We had very little choice with caravan parks, so again had to stay in a Big 4. Another mortgage taken out and in we went. 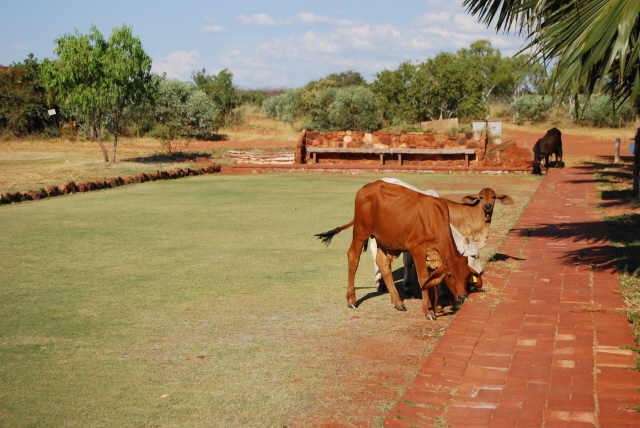 Our only other choice was 20 kms away at Dampier, a small park called the 'Dampier Transit Park'. As it was getting late we didn't risk driving the extra distance, (bad choice). We saw this park the next day. Absolutely on the water, really cute and as cheap as (like $15-00 a night). This is the place to stay if you are in this area. No question. The only down side is that you can only stay 3 nights. 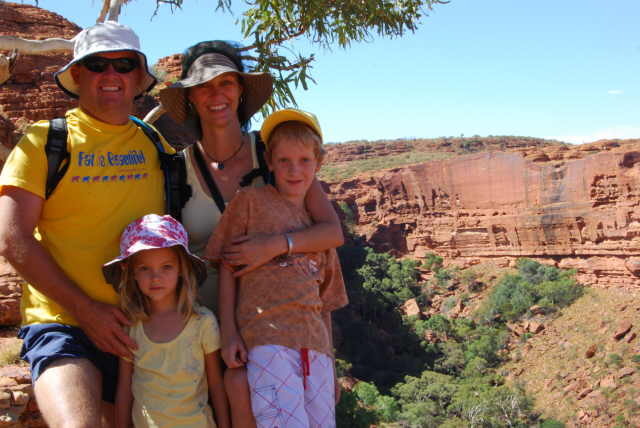 Now Karratha is a place we missed seeing last trip as we went out to Karijini. This is also a place you hear a lot of negative reports about. Yes, it is very industrial, but also has a lot of natural beauty. It is the third largest port in Australia, has the huge Woodside Natural Gas plant, salt works and other mines scattered around. Like most other mining towns in the West it is out of control. Let me tell you now, there is NO sign of any recession over here and when you ask the locals about it, they laugh. They did notice it a bit for a few weeks, months and months ago, but they are fully back on track. Now like most other mining towns unless you earn a fortune or have company accommodation, you just cannot afford to live there. Let me give you a few facts and figures. If you can buy a 3 bedroom house you will pay $800,000 and over a million for a 4 bedroom house on a block of land so small you have no yard. To rent it will cost between $1,200-00 to $2,000-00 a week. Most rentals return over $80,000 to over $100,000 a year. To rent a room in a house is over $400-00 a week. 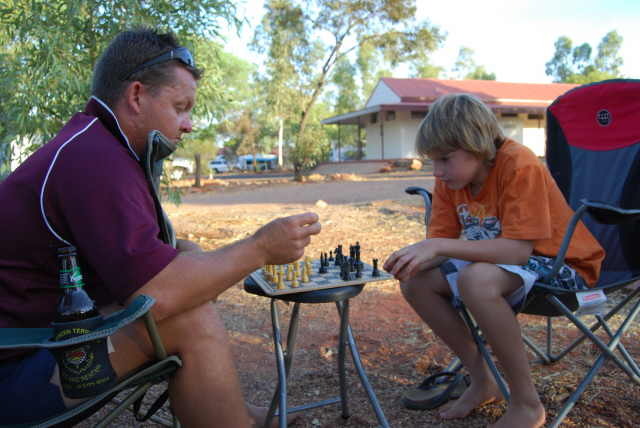 There were recently over 800 families living in caravan parks around the town. There is also a number of people earning big money who are not able to get any accommodation and have to live in their cars. Can you believe that? Fly in, fly out is what the major companies prefer, as many, many people can be housed in donger camps. The number of houses being built is hard to imagine. Hundreds and hundreds of them, as far as the eye can see. Who knows what the future holds for those landlords. Surely the day will come where supply will outstrip demand and the prices will have to drop. Prices like this cannot, surely be sustainable. We then had a day looking around. This is also a place you could stay for many days with a tonne of places to explore. 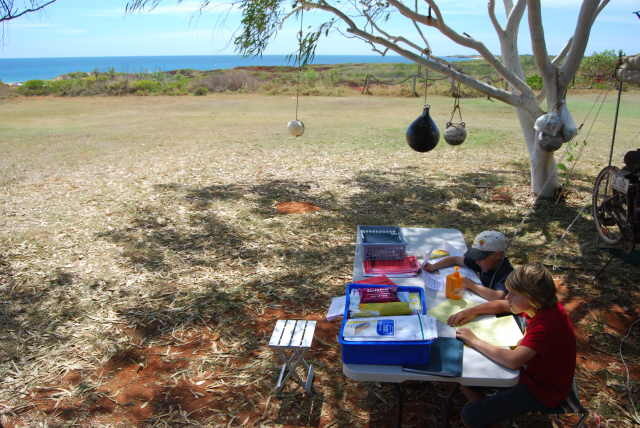 We went out to the 'Woodside Gas Plant Information Centre' at Dampier. This is another must see. It is excellent, overlooking the massive natural gas plant. There is a very good video explaining all about natural gas and how the plant was built. The boys loved learning all about it, and what a science lesson. We were also fortunate that the young lady working at the centre had a real passion for her job. She was fascinating to talk to and a great ambassador for the company that she works for. The boys thought that Vera was just the best. Its a real shame there is not more Vera's in this world. The boys did a 'Fact finding Quiz' and collected some great prizes for getting it all right, including a stubby cooler for my collection. Karratha is a very interesting mix of heavy industry and residential living. The beaches have lovely white sand and are very picturesque, even though they look out towards a loading facility of one kind or another. The shopping centre is huge with every shop imaginable. It is a nice town and yes it is worth visiting, despite what the knockers say. Next it was off to Port Hedland to see our niece Jessie and her boyfriend Colin and to collect our mail. Caravan parks in these mining towns are hard to get into as they are all filled with workers. So much to my disgust we again stayed in a Big 4. Again a nice park but so damn expensive. Jess and Colin came over for dinner, we did some shopping and the next morning had us out of bed at 0430 to attend the Anzac Day Dawn Service. There was a huge turnout and a really good service. Even the big companies like BHP allow staff to arrive late to work or leave early to be able to attend the ceremony. That is truly Australian. Good on you BHP. We then went to the Anzac Day breakfast at the Pilbara Regiment and had a nice cooked breaky. We were back at the caravan park by 0830 and then had to decide to either stay the day or move on. We needed to be in Broome by Tuesday which gave us a few days to fill in. We really wanted to get back to Barn Hill Station, one of our favourites. We did decide to head off with a number of possible destinations available, depending on how tired we became. With the shared driving and a nap on the road we did the 500kms easily arriving at Barn Hill by 1600. We scored a nice site overlooking the ocean, close to the shop and bowling green. This is the best place around to relax, unwind and just chill out. It just has a great relaxed feel about it. All day to do what ever you wish. Chris and the boys did school work while I did this web page update. 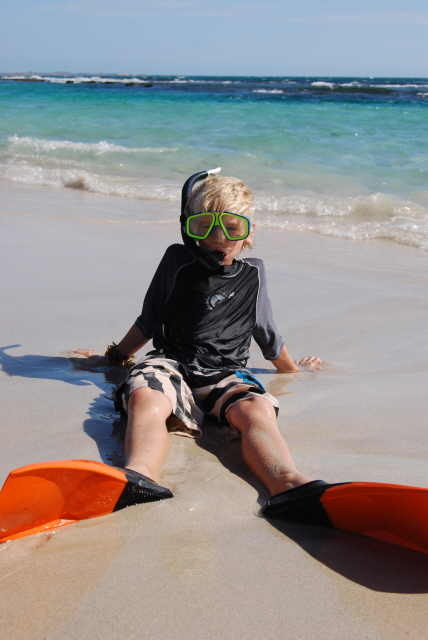 We played numerous games of lawn bowls, swam, walked on the beach and played cricket. I could easily stay here for a few weeks and we may just do that between when we finish up at Kalumburu and when the Joiners arrive. With Broome only an hour up the road, why you would stay in Broome is beyond me. Peace and quiet, a much nicer beach and no traffic. This place is for us. 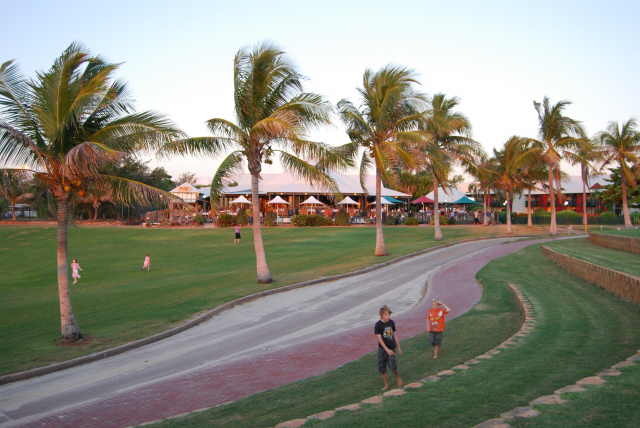 Tuesday morning we set off for the short drive to Cable Beach Caravan Park. I shot off to the hospital to sort out the paperwork for Kalumburu . We are still hopeful that we may be able to drive up as opposed to having to fly. That would be a pain due to restrictions on the amount of luggage we could take and because we would then need to go back to Kununurra and collect the car and camper. We will have to wait and see what happens. The Gibb River Rd is now open, with the Kalumburu road still closed. We believe the problem is Drysdale River which is still a little deep. Hopefully it will drop enough for us to get through. We spent a few days in Broome getting organised, food and barge accounts set up, shopping and the usual jobs we do before heading 'bush'. The Clarkes (Dean, Jill and Kaitlin) were camped next to us, so our social life was full-on. A friend of theirs was staying at Cable Beach Club Resort, so we wined, dined, swam and watched the famous Cable Beach sunset from the luxury of the resort - talk about living it up!! We need to head bush to give our livers a rest - that lot are bad influences! We will miss these guys - we have had lots of fun with them. So that is pretty much it. It has been busy and we have covered a few kms, but its been fun and an adventure. What a life. We are all looking forward to Kalumburu and a new area to explore. And yes, we are looking forward to a short break from the camper trailer, as much as we love it. Finally we have made it back to the Kimberley's. Until next month. You cant stay young forever, but you can be immature for the rest of your life.